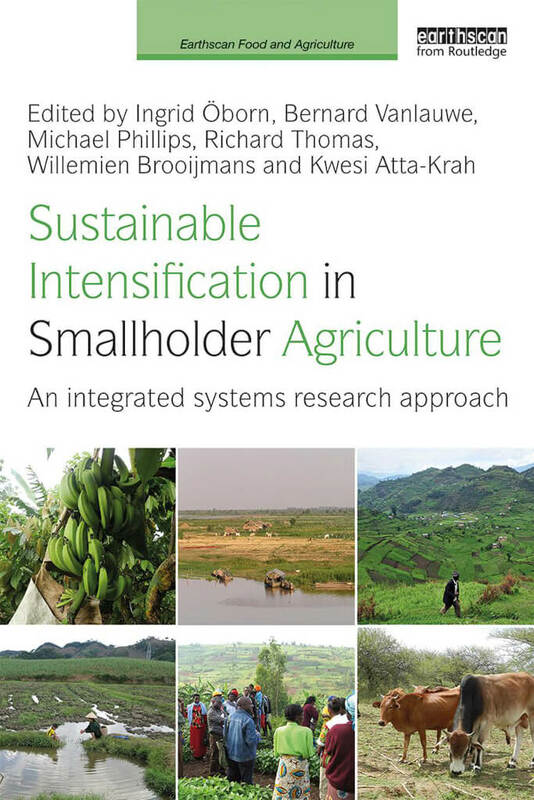 In compliance with IITA’s Open Access policy, the recently published Routledge book titled “Sustainable Intensification in Smallholder Agriculture” is now available online. The book focuses on the sustainable intensification concept and showcases its ecological, economic, and social dimensions, and describes different aspects of systems research in agriculture in its broadest sense. Much of the work represents outputs of the three CGIAR Research Programs on Integrated Systems for the Humid Tropics (led by IITA), Aquatic Agricultural Systems, and Dryland Systems. There are four central themes around which the chapters are based: the conceptual underpinnings of systems research; sustainable intensification in practice; integrating nutrition, gender, and equity in research for improved livelihoods; and systems and institutional innovation. Case studies are taken from countries and agroecological zones in Africa, Latin America, Southeast Asia, and the Pacific. The book was published as part of the Earthscan Food and Agriculture series and was edited collaboratively by Ingrid Öborn, Bernard Vanlauwe, Michael Phillips, Richard Thomas, Willemien Brooijmans, and Kwesi Atta-Krah. Digital copies of the book can be downloaded at https://cgspace.cgiar.org/handle/10568/89642 .